Atlanta Braves Punished for International Signing Violations. Major League Baseball has come down hard on the Atlanta Braves following an investigation into their international signing practices. Both former GM John Coppolella and the Braves have received harsh punishments. Coppolella has been placed on MLB’s permanently ineligible list. Meanwhile, the Braves have lost 13 prospects, most notably shortstop Kevin Maitan. “The investigation established that the Braves circumvented international signing rules from 2015 through 2017,” explained a statement from MLB commissioner Rob Manfred. 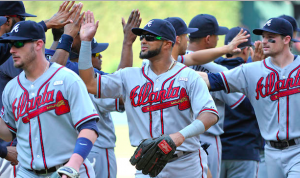 “During the 2015-16 international signing period, the Braves signed five players subject to the Club’s signing bonus pool to contracts containing signing bonuses lower than the bonuses the Club had agreed to provide the players. The 13 players involved in Atlanta’s wrongdoings have all been released from their contracts. They will be able to sign with any of the other 29 teams. The Braves are also forbidden from spending more than $10,000 to sign an international free agent during the 2019-20 signing period. Atlanta has also lost a 3rd round pick in next year’s amateur draft for offering impermissible benefits to a player they drafted. Manfred will also look into punishing specific Braves personnel as they learn more about the roles certain individuals played. The hammer has already been dropped on Coppolella, who may never work in baseball again. Coppolella resigned from the Braves in October when the investigation became public knowledge. The Braves responded to MLB’s ruling with a statement saying that they will accept the penalties. For the Braves, such a punishment could end up having a long-term impact. Losing 13 young prospects will certainly hurt them in the lower levels of their farm system. Maitan, in particular, was their 4th best prospect, according to MLB.com. He signed for $4.25 million and is one of the most hyped prospects to come out of Venezuela in a long time. Catcher Abrahan Gutierrez, who signed for $3.5 million, is another important prospect the Braves have lost. Being limited in how much they can spend on international free agents during future signing periods will also hurt Atlanta in a significant way. In the short term, the Braves have already started to move on. Earlier this month, the Braves named Alex Anthopoulos as their new GM. Last week, John Hart resigned as President of Baseball Operations. He wasn’t implicated in MLB’s investigation. However, he was in charge while Coppolella committed these violations. His position is also redundant with Anthopoulos taking charge of Atlanta’s front office. Under Anthopoulos, the Braves figure to be in good hands moving forward. However, they are likely to be feeling the effects of MLB’s punishment for many years to come.